Having never been to Knockhill before, racing on the track in the opposite direction and being required to carry extra BOP weight, Lewis was on his back foot before he even started. However, Lewis put in a fine effort to qualify in 7th place, but with a penalty imposed on one of the other drivers, this meant he would start from 6th on the grid. 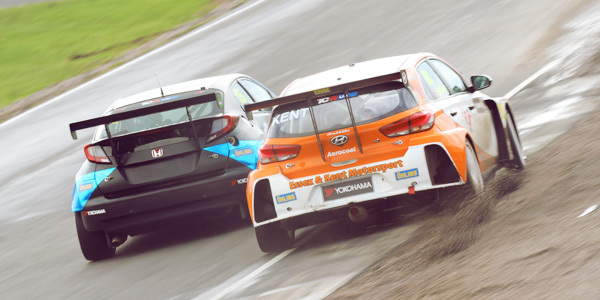 Race 1: Starting from 6th on the grid Lewis was up to 4th by the first corner only to be pushed into the gravel by another car – we say gravel but due to the amount of rain during the week it was more like mud and it covered the windscreen impairing Lewis’s vision. This lack of visibility was to prove Lewis’s down fall because without be able to see properly he was missing his brake points and not hitting apexes and on lap 16 Lewis crashed out after getting his braking wrong and hitting the tyre wall. Race 2: Fortunately not too much damage was done in Race 1 and the Essex & Kent team were able to get Lewis out for the second race. Wanting to make up for scoring no championship points in the earlier race made Lewis more determined than ever to put on a good show in race 2. Starting from grid position 3, Lewis had one of his spectacular starts going into 1st place by the first corner, he held the lead for 6 laps before tyre problems ensued and by lap 10 he had to come in to the pit because the car was un-driveable. The front right tyre was changed by our ever efficient pit crew and Lewis was sent on his way to collect as many point as possible, he finished 8th but if he had not had the tyre issue he could definitely have been on the podium. After just two meetings it is safe to say that Lewis is driving extremely well and if TCR get the balance of performance sorted out and the tyre issues are cured we believe Lewis will be fighting for podium finishes in every race. 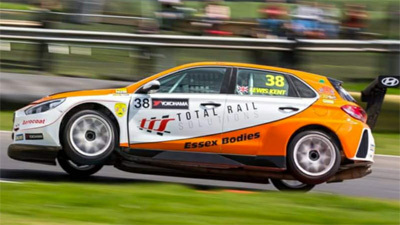 This entry was posted in Race Reports, TCR UK and tagged Essex & Kent Motorsport, Essex And Kent Motorsport, Knockhill, Lewis Kent, TCR UK, TCR UK Touring Car. Bookmark the permalink.